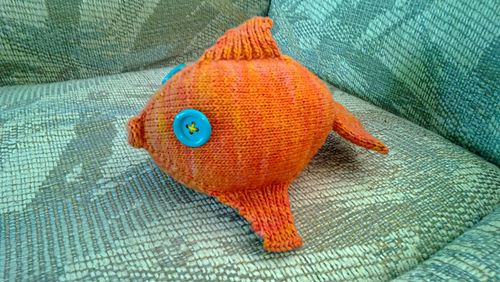 This cute fishy is knit in the round from the tip of the nose to the end of the back tail. Then stitches are picked up along the top and sides in order to knit the fins. The entire fishy is then felted in the washer machine. This would make a great gift for a little one or for any fish lover in your life. If you like my designs join my ravelry group where you can get pattern help and advice from me as well as info about sales and contests.